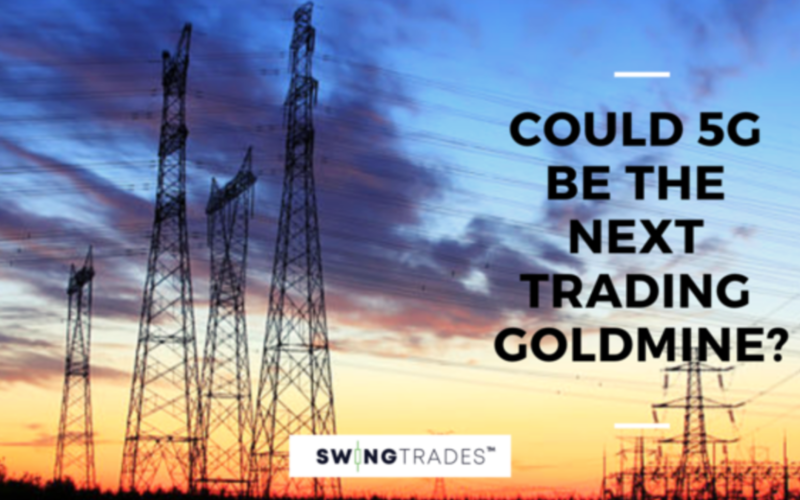 Could 5G Be the Next Trading Goldmine ? One of the key differences between good and great traders is the ability to think ahead. This can help you find a trading goldmine . Good traders are executing trades based on the current hot sectors and trends in the market. This isn’t a bad strategy per se, but your growth potential may be limited because a high level of awareness leads to greater competition. However, great traders are one step ahead of the game. They’re trying to figure out what tomorrow’s trends will be so that they can take advantage of them today. This is the strategy that I focus on as a swing trader, and the one that I believe offers the most potential for growth. Every year, certain sectors and stocks enjoy massive growth, typically within fairly short time periods. By considering what the next hot sectors will be, you have the opportunity to get in on the ground floor and enjoy rising stock prices before other traders have gotten in on the action. For example, CBD related stocks have been dominating the market in recent weeks. Trouble is, it’s no longer a little-known niche, which means that stock prices are already rising. That means it’s time to get ahead of the pack by thinking about the next hot sectors. In this post, I’ll introduce you to another potential hot sector coming up this year: 5G telecom technology. Here, I’ll offer an explanation of what it is and why it’s an exciting prospect for swing traders. What Is 5G Telecom Technology? First things first: What is 5G telecom technology? You’ve probably noticed that on your cell phone, there’s a little number at the top indicating the generation of technology your device is using. For most of us, it’s either 4G (or maybe 3G if Santa didn’t bring you the latest iPhone). 5G is the next generation of mobile technology. It stands for fifth generation, and it promises to be bigger, stronger, faster, and better than 4G technology. Everything will be quicker and more streamlined, meaning you can watch videos with fewer hiccups, Google things faster, and use more apps without slowing down your system. What Makes 5G Telecom Technology a Hot Sector? Technology advances are happening every day, so why does this 5G update matter? Here’s the thing. 5G doesn’t just represent faster and more streamlined service. It represents a new style of technology, too. Unlike today’s technology, which involves low frequencies, 5G technology will attain those high speeds via higher frequency bands on the wireless spectrum. There’s a sticking point, though. With the new technology, the high-frequency wave signals won’t travel as far, so the new networks for 5G will require more cell phone antennas and in closer proximity to one another. The towers won’t have to be as big, but there will have to be more of them. It may sound like a big pain to build all of those new antennas, but there’s a long-term benefit. Think of it this way: it’s almost like outfitting an old house with a new electrical system. If you’re going to the trouble, you don’t just want to update those out of date wires, but you want to make sure the house is equipped with the outlets and technology to accommodate future use and needs. This is what’s going to happen with the infrastructure for 5G technology. Yes, it will require a big new buildout. The upside is that once the new infrastructure is in place, it should be good for the next several years’ worth of technology upgrades. This is also a necessary update because internet connections and devices are still growing exponentially. According to some estimates, the number of devices connected to the internet could top 31 billion by next year. When will this incredible 5G technology be available? Unfortunately, there’s not a specific release date on the horizon. However, big providers like Verizon are already known to be testing 5G technology, which means it’s not a matter of if, but when, it will be rolled out. Since the new technology will involve installing a new infrastructure, it might still take a little time. 2020 is a good guess for an initial rollout, but it might still be a few years before 5G is the norm. As it turns out, though, this isn’t such a bad thing from a trading perspective. It means you still have an opportunity to jump on board ahead of the curve. A reliable development. No, 5G technology isn’t available to the public yet, and we don’t know exactly when it’s coming. But it’s definitely coming, and trading opportunities are available even now. Exponential growth potential. It might seem like we’re as connected as we possibly can be, but there’s still plenty of room for growth. Internet connectivity is no longer limited to computers, tablets, and phones. Home security devices, appliances, cars, and even pet collars are incorporating internet connectivity, which means that there’s still room for exponential growth in this sector. Many trading opportunities. The 5G network isn’t just about tech. Since a new infrastructure of antennas will need to be built and installed, there are additional opportunities for traders to look into ancillary industries and invest accordingly. Over the years, I’ve figured out a reliable system of finding hot sectors before the masses by identifying sector leaders, earnings winners, and finding hot IPOs. I teach my methods for identifying momentum stocks before they peak to my students in my SwingTrades program. As a teacher, I’ve guided over 1,400 students from over 50 different countries to figure out how to get ahead of the curve so that they can maximize their potential for account growth in their trades. My students have benefitted from these teachings, with many reporting six-figure profits — and there’s even a reported millionaire* in the mix! When you join SwingTrades, you, too, can learn how to sniff out the hot sectors ahead of the pack, so that you’ll be in the best position to take advantage of trends before they happen! Are you ready to stop chasing stocks and to start making more proactive trading choices? How will you make that happen? Leave a comment and let me know!